Puerto Princesa in Palawan is better known for its white sand beaches and tropical rain forest, but the city also has something to offer. Before heading to the beaches of Palawan which are only an hour away from the center of town, you can spend part of your day roaming around the city for a short tour. If you plan to see more of the city, consider booking a hotel in the heart of Puerto Princesa city. One of the best hotels in Puerto Princesa is the Sunlight Guest House. This is a 4-star Palawan hotel located in the center of the city. It is close to key establishments for dining and recreation. 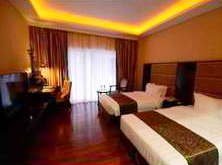 It’s a fully equipped hotel with its own ATM machine, business center, and other standard amenities found in typical 4-star hotels. It offers a breath-taking view of the Puerto Princesa Bay and the ocean. It’s the perfect place to stay if you wish to take the Puerto Princesa City Tour. For this Palawan Tour, you will be taken to the Baywalk, Immaculate Conception Church, Plazaz Cuartel, and a souvenir shop if there is still time left in the 4-hour expedition. 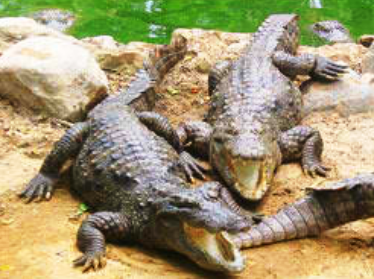 Exciting parts of the tour include a visit to the Crocodile Farm, a mini-zoo, and the Research Institute for the study of crocodiles. You will visit the Binuatan Weaving Creations where you will see weavers create products that you may also purchase. Mitra’s Ranch is a large property with a log cabin where you can see scenic terrain or just relax in the veranda. Another stop will include a visit to Baker’s Hill where you can indulge in sweets, pastries and freshly baked bread. You can also add an optional side-trip to your city tour by stopping by the Butterfly Garden. The entrance fee to the garden is not included in the tour package. Here, you can feast your eyes on the beautiful colors of butterflies indigenous to Palawan and other places in Southeast Asia. 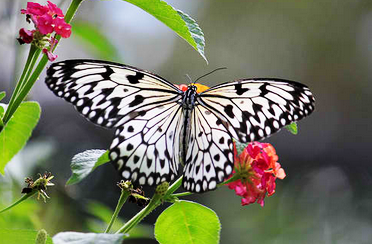 The Puerto Princesa City Tour can take 4 hours or a little longer if you drop by the Butterfly Garden. If you plan to stay the night at a Palawan hotel in the center of Puerto Princesa, you will still be within driving distance to some of the best beaches in Puerto Princesa. This entry was posted in Palawan Hotels, Palawan Tours Activities and tagged Hotels in Puerto Princesa Palawan, Palawan Hotels, Palawan Tours Activities, Puerto Princesa, Puerto Princesa Hotels, Sunlight Guest Hotel Palawan by boracaypalawanhotels. Bookmark the permalink.